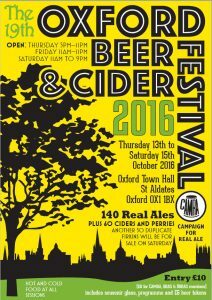 Woodley Sider will once again be available at the Oxford Beer & Cider Festival taking place from Thursday 13th October to Saturday 15th October (see poster below). You’ll be able to get a pint of ‘BRW Sider’ @ 6.6% so if you’re in the area jog on down and support real beer and cider at its best! 2016 production – the season starts!